no need to turn off your PC to plug a device in or out. MFCJ450DW / HP Envy 4500 and more. crosstalk thus ensuring high speed up to 480 Mbps error-free data transfer. Gold-plated copper contacts provide maximum conductivity and minimize data loss. 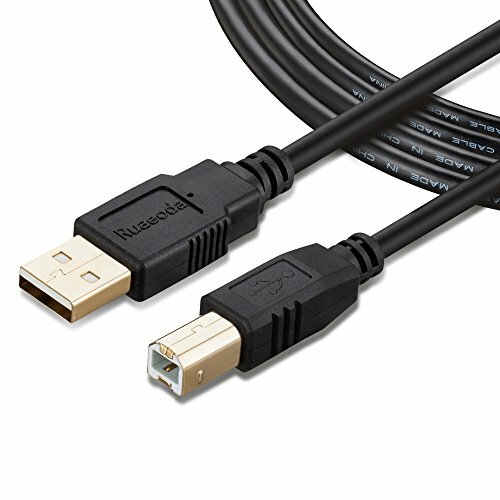 USB 2.0 printer cable is ideal for connecting your scanner, printer, server, camera and other usb b devices to a laptop, computer (Mac/PC) or other USB-enabled device. The Printer Cable is compatible with common devices with USB type B connector like Arduino, Blue, Brother, Canon, CyberPower, Dell, Epson, Fujitsu, HP, IOGEAR, Lexmark, M-Audio, and Samsung. Verify your device has a Type-B Female port & not a standard USB, Micro-USB or Mini-USB port. If you have any questions about this product by Ruaeoda, contact us by completing and submitting the form below. If you are looking for a specif part number, please include it with your message.